The role that space has in our lives is now taken for granted: we have become reliant on it every day – whether it be for weather forecasting, satellite TV, banking, communications or navigating in our cars. It is now part of our national infrastructure underpinning our economy, security and well-being. Synthetic-aperture radar (SAR) imaging from orbit is not new — almost 40 years ago, the Spaceborne Imaging Radar (SIR) flew on two shuttle missions to image Earth from above. On May 18, 1969, just over four hours into their mission to the Moon — the dress rehearsal for the first lunar landing — the crew of Apollo 10 pointed their video camera through the command module window toward the Earth. A BridgeSat Focus—Design and Application of Space-Based Optical Communications, By David Mitlyng, Product Management, BridgeSat Inc.
For many decades, NASA and other government-based space organizations, have led, driven, nurtured, and helped to create, a robust and fertile ecosystem leading to the commercialization of space-based technologies. Some 7,000 satellites have flown on orbit during the 60 years since Sputnik was launched. A jet fighter pilot, Lt. Col (Ret.) of the Israeli Air Force (IAF), Meir has more than 20 years of experience in management, R&D and operation of state-of-the-art projects in Space Systems and Unmanned Aerial Systems. 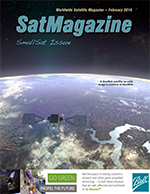 Small satellites (smallsats) are creating new and disruptive opportunities in today’s space industry — applications that were once the purview of traditional satellites in geosynchronous equatorial orbit (GEO) are finding that, in a growing number of cases, those applications (Earth observation [EO], imaging, etc.) are being performed by small satellites in Low Earth Orbit (LEO). The space industry’s wagon is packed with constellations — and that wagon is getting heavier by the day.